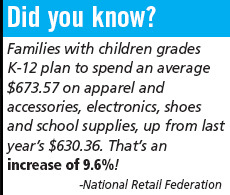 Iowa’s annual Sales Tax Holiday is synonymous with back-to-school shopping. But the two-day event, Aug. 5-6, waives the typical sales tax for plenty of other occasions. During these two days, no sales tax is collected on the sale of select clothing or footwear priced less than $100. And it applies to each exempt item, regardless of how many are sold on the same invoice. You don’t need to have a student in the family to reap the savings. If you are planning a wedding, the parent of a baby or even on an early hunt for the perfect Halloween costume, you might be able to skip the sales tax too. Like with any shopping event, it’s important to plan ahead, use your coupons and stick to a budget, says Lynne Willenborg, lending consultant at Dupaco’s Dyersville, Iowa, branch. It can be easy to get swept up in the sales-tax savings and spend more than you would have on a typical shopping day. If the Sales Tax Holiday is a popular event for your family, Willenborg suggests opening a You Name It Savings account to start systematically and automatically saving for next year.